No, we’re not talking the about the Pop/Rock group by a similar name, or “Sierra Sam” (the first crash test dummy used for aviation testing). We’re talking about the crash test dummies used for automotive safety testing, and one of the first crash test dummies was actually a live person and definitely no dummy. James J. Ryan was a professor in the University of Minnesota’s Mechanical Engineering Department from 1931 to 1963. Not only did he research and create safety features for cars, he also crash-tested these devices himself, which earned him the nickname of “Crash”. In fact, Professor Ryan was actually one of his own favorite test subjects. 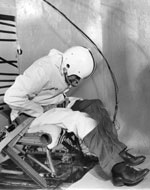 Sporting a white football helmet, he would strap himself into either a car or a “crash sled” – a padded chair on a fast track – and then be thrusted into a barrier at 20 mph. He conducted dozens of hands-on crash tests which made him a campus legend during the 1950s. Ryan would eventually hand over the role of “test subject” to non-human dummies. The story doesn’t end here though. He also received the patent for the first automatic retractable seat belt in 1963. His patent was for a seat belt that would maintain a certain amount of tension, but then give or retract under normal driving conditions. If there was sudden deceleration, the seat belt would lock up to reduce the forward motion of the driver or passenger. Over the years, he had tried to convince Detroit automakers that the retractable seat belt should become standard in American cars, but his requests fell on deaf ears. In 1965, he partnered with Ralph Nader (the consumer advocate) and in 1966 they helped get the “National Traffic and Motor Vehicle Safety Act” passed. Part of this Act required that all U.S. passenger vehicles have seat belts beginning in 1968. The work that Professor James J. Ryan completed over his lifetime has been instrumental in saving lives. Forexample, according to a 2004 National Highway Traffic Safety Administration report, safety belts have saved close to 180,000 lives between 1975 and 2003. Those aren’t the only lives that he has saved. Before he started his research at the University of Minnesota, he was credited with another landmark invention, the “V.G.A. Flight Recorder”, or more commonly known as the aviation “Black Box”. With research funding from General Mills in Minneapolis, MN, he developed a crash proof box that would record and preserve flight information in the event of a crash. Earlier attempts by others had failed until Ryan’s device was introduced. Ryan passed away in 1973 at the age of 69.